*Note: Because of the similarities in names of the websites, I often refer to the FSM-A as the "Rossman Archive" or the "Free Speech Archive," and the FSM Digital Archives as the "Bancroft Archive" or the "Digital Archive"
The Free Speech Movement was a student-lead protest at the University of California, Berkeley during the 1964-65 academic school year. Fighting for their basic right to free speech, students protested against the school administration’s ban of on-campus political activity. The demonstrations were unprecedented at the time and have been interpreted as spearheading the student activism that was so prevalent in the late 1960s. A brief Google search produces several results for “Free Speech Movement” but only provides about two legitimate public history websites on the topic, both based in Berkeley, California: The Free Speech Movement Archives (http://www.fsm-a.org/) and The Free Speech Movement Digital Archive (http://bancroft.berkeley.edu/FSM/). Both websites are true to their titles, providing more of an archival service than an interpretive one. However, further exploration within these websites reveals that a consolidation of the material presented by each archive could result in a more effective presentation of the history of the Free Speech Movement. Each website states its goal prominently on the homepage. 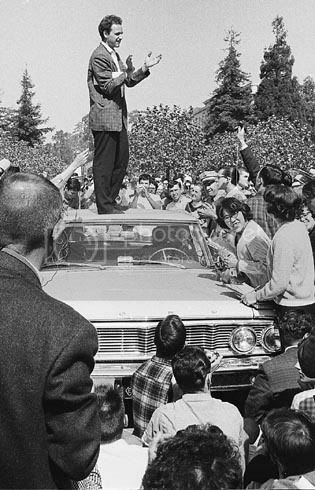 Presently managed by FSM participant, Michael Rossman, the Free Speech Archive offers, “a spectrum of opinions on what FSM was,” and information about Mario Savio, one of the most prominent student leaders to emerge from the movement. The site emphasizes that it not only presents a range of perspectives on the FSM, but that it has “an extensive suite of documents of the conflict.” The website also offers, at least on the homepage, the opportunity for FSM “Vets” to share their experiences and participate in the dialogue. The website does include a variety of different narratives and interpretations of the FSM along with different chronologies of the conflict which is an interesting way to interpret the event. These differing opinions are presented, however, in a simple list format. In other words, there is no interactive element to these interpretations. While some of the narratives and analyses are available through links on the website, often times Rossman simply lists a bibliography of texts available elsewhere. This is a valuable service, however, one that does not take advantage of the digital format. The Digital Archive is also straightforward in its goals stating that it documents the role of Mario Savio and other students in the FSM. Rather than emphasize a range of perspectives, however, the Digital Archive aims to document FSM’s “origins in political protest and civil rights movements and its legacy of political activism.” The Digital Archive, therefore, takes on a more ambitious goal of producing the history of this particular conflict as well as tracing its roots to earlier movements. Rossman’s Free Speech Archive attempts to address the legacy of the movement through the memories and current happenings of FSM “Vets,” while the Digital Archive focuses more on the larger impact the protest had on activism and educational reform. While the perspective of the Digital Archive extends further back historically and takes the legacy of the FSM a step further, it also only provides extensive bibliographic and archival information with little interpretation. Rossman’s Free Speech Archive relies heavily on text-based documents. Granted, the site never boasts about a range of material, only a range of perspectives. Among the texts included are transcriptions of pamphlets and other ephemera distributed during the conflict, meeting minutes, reports written after FSM, and links to other books. There is a link to various photo “galleries,” however many of these are located off the main site or only contain a few photographs embedded within the pages. Perhaps the most fascinating aspect of the website is Rossman’s attempt to organize the material he has collected and document potential material otherwise unavailable. For example, under the “Who said what to whom?” section of the site, there is a link to FSM public documents and statements generated during the conflict. Here Rossman has created several tables organizing the documents contained on the site. There are tables for documents created by Students, Faculty, Administration, Tripartite Negotiation, Other UC Campuses, Off-Campus Sources, and Inter-Group and Internal Documents. Each table then contains more subcategories of creators. The Student table, for example, is broken down into sections for graduates, Civil Rights, Marxists and many others. This kind of organization is included in each table. While this has the potential to be an effective tool, there are very few links to actual material from these tables. In other words, in an attempt to organize his documents, Rossman reveals an overall lack of related material. One can appreciate his foresight and thoughtfulness in organization, yet this scheme provides little no practical help. His indexes of material function in a similar way, providing a long list of documents that could be in the archive, while containing links to the few that are actually available. Furthermore, the documents he does provide are mostly leaflets and pamphlets created by students which causes one to assume the material is based on his own personal collection. The Digital Archive provides a broader range of material including text documents and media, but also has its limitations. A product of the Bancroft Library at the University of California, Berkeley, the Digital Archive also provides links to online finding aids of protest collections within the library. These collections are not available to view online, therefore this FSM archive acts as a starting point for further research. The Digital Archive has a section titled, “Media Center,” on its homepage which offers links to online video and sound recordings. After clicking on this section, one is re-directed to the Media Resource Center at the main library on the UC Berkeley campus. (This is the equivalent to being re-directed to the Avery Fisher Center through the Bobst website.) This site allows users to view some documentaries online, but often times limits access to UC Berkeley users. Unfortunately, more often than not, an online version of the material is not available, but the catalog number is provided. There is also a link to the UC Berkeley Social Activism Sound Recording Project, which provides extensive online access to oral histories. The Bancroft Digital Archive also does not contain any photographs of the event directly on the website. As mentioned earlier, the creators of both websites differ greatly as do their audiences. The Free Speech Archive is maintained by Michael Rossman, a FSM “Vet” and former science teacher. Judging by aesthetics alone, one can tell that his website was created by a digital novice. Although, to be fair, the site was created over ten years ago and technology has changed. Unfortunately, however, much of the content on the website has not been updated recently. Rossman’s website appeals to a wider audience as evident both by his call for input from other FSM “Vets” and the informal language used on the site. The Bancroft Free Speech Digital Archive, sponsored by the University, appeals to a more academic audience and has a more formal tone. One can gauge the different audiences simply by comparing the organization of information on each website. For example, the Rossman Archive organizes the material thematically by asking such questions as, “What happened in the FSM?,” “Who said what to whom?,” and “What led to the FSM?” By contrast, the Bancroft Digital Archive organizes the material into six distinct categories: Bibliography, Text Documents, Finding Aids, FSM Project, Chronology, and Media Center. This is not to say that a legitimate public history website cannot categorize information by posing thematic questions. In fact, this scheme follows a standard “who, what, where, when, why,” format. However, the Digital Archive provides a much more basic, focused breakdown of the material and anticipates a user who might want access to particular materials by format. The websites are organized for different users with Rossman’s appealing to a wider audience trying to gain a basic understanding of the FSM, while the Digital Archive is aimed at a more academic or research-oriented user looking for primary sources. Furthermore, the Digital Archive often re-directs the user to websites available only to UC Berkeley students. For example, the “Media Center” links the user essentially to several catalog listing for many of the documentaries. This information is only useful for someone with physical access to the UC Berkeley library. Many of the videos that can be played online are also limited to UC Berkeley users only. Despite differences in audience the two websites were actually created with the same monetary gift to the University. Both are part of the “Free Speech Movement Project” and reference each other on their respective sites. The Digital Archive provides a background to this project and explains that the Free Speech Archive was also developed in partnership with the Bancroft Library. What is now (presumably) managed by Rossman was originally created by several veterans of the movement, and their archive has “generously shared” much of its material with Bancroft. The biggest drawback to both websites is that they offer almost no access to original material. In his introduction to the “Leaflets of the Free Speech Movement,” Rossman describes how this ephemera is the “life blood” of the movement. He provides embedded images of some original leaflets stating how one can see the “raw traces” of their productive process through the blotchy ink and typos of the documents. Yet, in the so-called “digitized” versions of these leaflets, Rossman provides transcription only. Again, this is a helpful tool, but as he argues, does not tell the full story of the movement. In terms of metadata, the Free Speech Archive provides a date for each leaflet as well as the creator. Sometimes, however, the source of the material is unknown. With support from the University, one might expect the Bancroft Digital Archive to contain scanned images of original material. While the range of text documents is extensive—from Government documents to Letters to Leaflets—the Digital Archive also provides transcription only for the material. Furthermore, the Digital Archive provides titles for many of its leaflets, but often excludes dates. The transcription only format is problematic not only because it takes away from the authenticity of the document but because differences in transcriptions between the sites can confuse users. For example, in a leaflet titled, “Showdown” (available on both sites) the Free Speech Archive transcribes some sentences using capital letters while the Digital Archive transcription has the same sentences in bold text. Which version is the most “authentic?” Should the user assume both are true? Having digital access to the original could eliminate the confusion. To further complicate matters, if one searches documents through the “Free Speech Bibliography” on the Digital Archive site, one is redirected to “Calisphere,” a self-described “world of primary sources.” Interestingly enough, the Calisphere website contains its own section on the Free Speech Movement complete with primary texts and over 240 images otherwise unavailable on the Bancroft website. With this re-directing to the Calisphere for primary sources and the Media Center for audio/visual material, the Digital Archive encompasses more like four websites within itself: the Archive, the Free Speech Movement Documentaries, the Sound Recording Project, and Calisphere. Bancroft's Digital Archive offers a wide range of material, however, it is scattered within so many other websites that the constant re-directing can prove frustrating and ineffective to researchers. The search capabilities are another area of possible improvement for both websites. A user cannot search the Bancroft Digital Archive as a whole, however one can search in the “Finding Aids” section of the site. This can probably be attributed to the Digital Archive’s relationship to the University and again suggests that the website is aimed at users interested in further archival research through at the Bancroft Library. The Free Speech Archive does allow the user to search the whole site. The search page is standard, and the site claims that “better matches” will be shown first. A search of “Mario Savio” in the text box provides numerous results, the first of which is a link to an article about the dedication of the FSM Café on the UC Berkeley campus. There are certainly “better matches” to be had within the listed documents than this particular article, therefore the actual ordering of the results is questionable. Overall, a consolidation of the material from each website would be helpful in creating more effective public history about the Free Speech Movement. Both the "Vet"-operated Free Speech Archive and the Bancroft-sponsored Digital Archive contain a good amount of material. However, the organization and access to this material can be greatly improved upon. It would be an interesting study to see how many people use the Bancroft site simply to look up material and finding aids in the Bancroft Library compared to how many people use the site as a prominent source of information. In other words, does the Digital Archive function primarily as a search/browsing tool for collections with the Bancroft Library or does it function on its own? Using the primary sources available in both sites to build a more interpretive website would be interesting as well. For example, one could utilize the various timelines presented by each site and link various leaflets and speeches given on specific days to these timelines. The Free Speech Archive and the Digital Archive certainly do not lack in material, but they could present these rich sources and organize them (using the latest technology) in a more effective and engaging way.